Check out our Events page to sign up! The Movember Foundation's message is simple: stop men from dying too young. The Foundation strives to provide tools and information aimed specifically at men to improve their health and prolong their lives. We can all help raise awareness of the Foundations 3 pillars: prostate cancer, testicular cancer, men's mental health and suicide prevention. 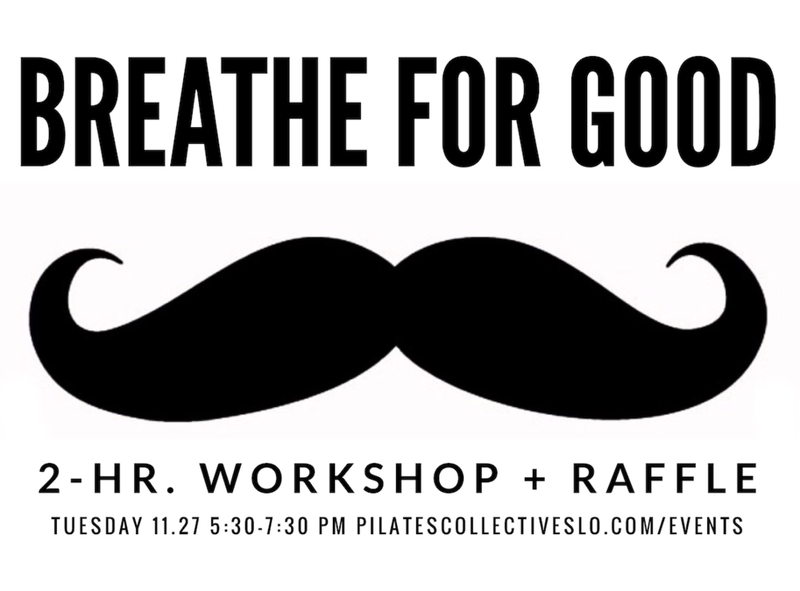 This November, Pilates Collective SLO and Expand+Breathe have teamed together to bring San Luis Obispo County a Free Breath Workshop + Raffle to help raise awareness for Men's Health and funds for The Movember Foundation. In this Breath Workshop, participants will be encouraged to slow-down a little and acknowledge their body, their health and their minds through Breath. We get it- sitting quietly, taking deep breaths and participating in meditation can be intimidating, scary or even seem wasteful in our fast-paced society, however, we argue it is necessary for a balanced life. Join us for a few hours of fun and exploration for a good cause. We look forward to working with you! Cost is free; donations are encouraged.